Welcome to Sennheiser's new 500 series.The HD 595 is the premier headphone of the range, boasting a new level of comfort and sound quality. Features include our E.A.R. technology and a highly constant,compressed cellulose fleece to reduce total harmonic distortion. 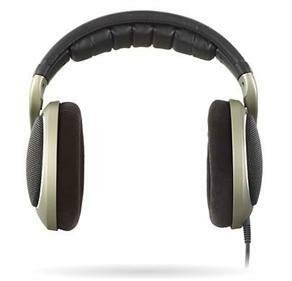 Velour ear pads and high-quality leatherette headband both provide outstanding comfort. 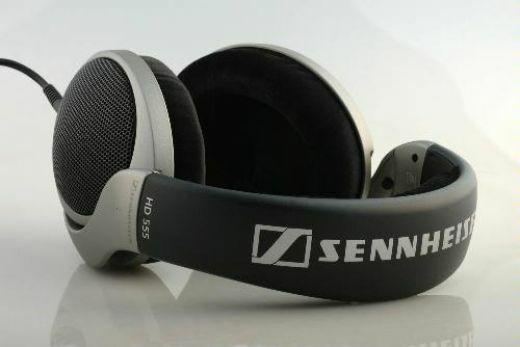 This Sennheiser HD595 is excellent. I paid € 190,- for it and it's worth every buck. De bass is clear and defined (not boomy), mids are good, treble is very clear and dynamic. The sound was really excellent. However I attached the connector to heavy multimedia speakers on the computer, they dropped to the floor often, resulting in bent headphone connections. I now find I cannot pull the cable out and put a new one in as you can with some models. It has to be fixed at the factory. Also, the headphones are not particularly comfortable to wear. I bought my HD595 about 1.5 year ago based on some good reviews in some forums. I always like it very much, but didn't know exactly how good it is compared to other more expensive ones in the market. The other day I walked into this arguably the most expensive and renowned hi-fi shop in Sydney, Australia, (their expensive systems are easily as expensive as small houses), and wanted to listen to their headphone amplifiers (I didn't understand why people need them). I was looking at about 15 headphones hanging there when the manager was about to let me listen to the headphone ampliers (the most expensive one A$1,600 --- for just a headphone amplier, it's ridiculous). I asked him which headphone he would recommend me to use, when he picked up the Senheiser HD595 I was secretly happy about his choice. I put that on and started listening to the lovely music from it. After that I asked the manager to show me another headphone he would recommend, he let me have another Senheiser priced at A$950 -- more than 3 times more expensive than HD595. When I listened to it for 10 seconds, I had to take it off, I couldn't stand the mediocre sound from it, and had to put the HD595 back on --- than I realized how good the HD595 is. I don't need to spend time to describe how good HD595 is, many others have done that in this forum. I only want to say that the most expensive hi-fi shop in Sydney is using it to demonstrate their headphone ampliers, it must be very very good, and I am so happy with my choice and my ears for music. By the way, just on the headphone amplifiers, at the end, I asked the manager if I already have a nice amplifier do I still need a headphone amplier (I didn't find those amplifiers any better than the sound from my Onkyo receiver), he simply said no need, and went on to say it's only some people want dedicated amplifiers for the headphones (he was only short of saying more about "those people"). He is right, with my Onkyo amplifier, I have great music and also have really good surround sounds on TV programmes, whereas you have no surround sound with these headphone amplifiers, how ridiculous. Ok listen, Grado SR-80 are good, akg k420 are even better, but this one easily kicks them both. Read more in my blog, www.hifireview.org. My main criteria for comparison is "musicality", messured with help from the "tune dem" method. The look closed, but they do have an open construction. Very nice clear sound which sometimes feels different (but not in the overall better-worse way) from the sound of my Logitech X-230 speakers with very nice sound also. I use them mostly walking around the city. The open build makes me turn up the volume by traffic but also gives me the advantage to talk to my friends while listening to quiet music. Being into dubstep I would enjoy heavier bass but the phones still deliver the bass feltably in a nice way. The structure feels comfortable walking around, but on a hot day outside the material of the padding will get the behind of the ears wet once again. Compared to my earlier large Sony earphones with blue earpads, Seinnheisers do not provide the advantage of keeping my mobile sturdy enough by my ear for easy hands-free talking. As another weakness, the plug at the end of the cord is huge, making it uncomfortable but manageable to fit a pocketed mp3. The phones give enough amplification on my Sony Walkman mp3 to enjoy music without city voices bothering me and at the same time not making me worry too much about damage to my ears from high volume. On laptop, the amplification can be too much. I have to warn you, though it's probably because of my second-hand pcmcia sound card, that listening with these phones on a high volume broke the phones for me and bass started crackling in the left ear ever since. Fortunately, I still had another month of guarantee time and they fixed the phones for me rather quickly, it must have taken a month at most. And now my Sennheisers are working right again and I'll be careful with the laptop. They have also fallen to the ground a couple of times without any detrimental effects. All in all I'm truly happy with this model at the $250 I paid. I was looking at reviews for some time and previous experience with Sennheiser biased me a little towards these headphones. Let's be clear though, these are sit-at-home-and-not-bug-the-neighbours type of products. They leak sound yes - so the person in the other room may well still hear them, but the point of these is to offer respectable sound quality without shaking the glasses off the shelf however entertaining the prospect may be. 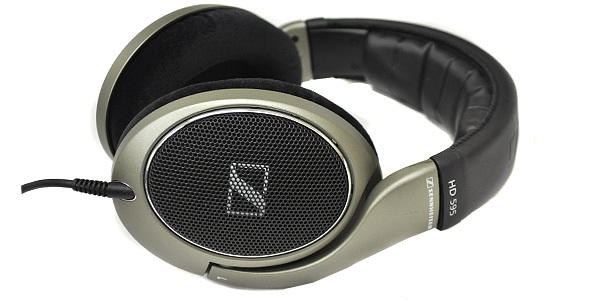 I chose these because the next model up is only done justice if it has a headphone amplifier. I wanted a solution that could be plugged into a laptop and thus far I have been delighted with its sound quality. These units do require a fairly long "break-in" time so users may initially be a little disappointed but persevere and you will find that they become much more supple later on. If you are in the market for headphones in this price range and you are looking to use them around the house then I cannot recommend these highly enough. Firslty I have to thank this website - I bought these headphones after about 2-3 weeks of searching review sites like this, I have to mention that these are my first hi-fi grade headphones. The best word to describe these headphones is BRIGHT , the sound is really bright, some of you said that it doesn't have a "punchy bass" , I trully think that this is beacause these headphones do not artificially modify original sound (personally i think the bass does not need any improvement). My previous ones had such a punchy bass, that i could feel my eardrum tremble, but it didn't sound like it was loud (+ everything i was hearing had a shift toward the lows) , the HD595 have a bass just as it was designed to be in the recording studio. Because I sincerely bought these for gaming - music was second priority - I have to say they are more precise - but you have to get used to the different sound [at least 2 days] , everything sounds different and to be honest in gaming with no "punchy" bass from the weapon sound /etc it was a real strage feeling like - oh, that was how it was supposed to sound :) . With other headphones , after about 4-5 hours of listening at a slightly louder volume , some mid to high notes kind of scratched my ears, and I had to stop the music or change the track because I couldn't stand it. With the HD595 , I had no problem with any notes, even very loud highs don't discomfort me in any way. Highly Comfortable! - BIG plus for long listeners. cable connection at headphone makes a little noise when forces from the cord travel to the location and are dissipated there. These are my 'phones. They're what I use while I sit at my computer. And I sit here a lot. I've had these for at least three years. They were purchased shortly after the product was first sold. They've been driven with and without amplification in addition to the output on my audigy or Xfi sound cards, which put out a considerable amount of power. My HD-600's and HD-590's both pooped on me. I blew them out. They both developed loose, farting sound in one ear. I refuse to not try to go deaf. Heh. Last night, I left my computer running. I thought the fire alarm might be going off again, as my girlfriend and I both woke up at 2 AM to to a rather piercing (admittedly not as piercing as the old, removed, fire alarms) sound. I left the bedroom to investigate the noise, and after a minute, pinpointed the source of the sound. Amazingly, my ears lead me to the headphones. As my head got about a foot away from the headphones, the sound literally hurt my ears. It HURT MY EARS it was so loud. I'm not sure what happened, but perhaps the soundcard, which was apparently not screwed into the PCI slot, may have come loose and froze my computer and caused this weird audio anomaly. In summary, this is the most durable pair of headphone drivers I've had, except for a painful pair of sony mdr700's, which I no longer own anyway.